Chinaplas will be celebrating its 30th edition from 25-28 April 2016 at the Shanghai New International Expo Centre (Pudong). The organiser, Adsale Exhibition Services, has planned a myriad of exciting activities to commemorate this. The show is expected to welcome 3,20 0 exhibitors and 140,000 professional buyers, on over 240,000 sq m of exhibition area. The global medical products industry has never been more dependent on plastics and rubber suppliers to help them meet today’s healthcare needs. In response to the rapid development of this area, Chinaplas 2016 will organise “The 2nd Medical Plast ics Conference” f rom 25-26 April in attempts to give visitors insights on new technology breakthroughs and latest development on medical plast ics and thei r appl icat ions on medi c a l de v i c e s , medi c a l di spos abl e s and packaging. Provisional topics include: automation technology for production upgrade, production technology for cleanrooms; medical grade polymer applications for disposables; pharmaceutical packaging solutions; innovative applications of 3D-printing; sterile barrier systems for medical packaging. The conference will be in bigger scale as compared to the last edition. The concept of Germany-led Industry 4.0 has been taken the world by storm since its introduction in 2014. It had laid down a roadmap of the fourth industrial revolution for realising “Smart Factory” that the world has been pursuing of. As China’s economy matures , the Chinese government has launched “Made-in-China 2025” to promote industrial automation in its own right in a bid to help Chinese enterprises to stay competitive in the world. In this light, Adsale has teamed up with the German Engineering Federation VDMA to organise Industry 4.0 Conference. Held from 26-27 April, the conference will invite leading firms and heavyweighted speakers in this field. Some of the topics are: Use of Industry 4.0 Concepts in one company – smart factory by Haier Inc.; Industry 4.0 from the perspective of an injection moulding machines manufacturer by KraussMaffei; Individualised mass production by Arburg; Inject 4.0 – solutions for a smart factory by Engel, and many more. 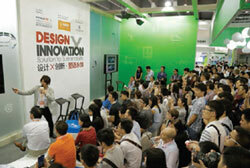 Building on the success of “Design X Innovation” at Chinaplas 2015, this event will come around in Shanghai in 2016. The event's Exclusive Partner – BASF – the world's leading chemical company, will join hands with Chinaplas to give new perspectives to visitors on how design and plastics technology can together drive innovation, that in turn helps to make customer more successful and leads to a more sustainable future. The event showcases samples of the latest designs on outlook, structure and function designs inspired by high performance materials for different industries. “Design X Innovation” will engage and inspire audience in an array of offers including display gallery, open forum led by revered international experts, as well as interactive activities. There are two types of entry tickets – a oneday pass (RMB30) and four-day pass (RMB50). Visitors who successfully pre-register on or before 12 February 2016, at www.ChinaplasOnline.com/ prereg will enjoy free admission and receive a visitor badge in advance.